Property Apps… all you need to know! "There’s an app for that”, the typical response for most things nowadays. Digital tools are reshaping many industries, providing consumers with a wealth of information at their fingertips. The property industry has embraced the digital environment and it has certainly effected everyone- from homebuyers and sellers to agents, landlords and even renters looking for a new housemate. Nowadays there are estate agents who operate purely online or ones like us who do both online and instore. Having formed relationships with property portals such as Rightmove and Zoopla, you can view many of our properties via this platform. With the majority of people now accessing the internet via their mobile device rather than a desktop, property-related apps are starting to come to the foreground. It can be a little confusing knowing what’s what, so here is our guide to some of the best- from property searching, location awareness and home inspiration. Their all-new modern looking and intuitive dashboard makes finding the perfect home pretty simple. With hundreds and thousands of listings, their latest property app personalises your property search for everyday ease-of-use. Whether you are looking to buy, rent a property or simply just fancy a browse, you can access the most up-to-date market information either at home or on the go. The app also enables you to get in contact with estate agents, helping you make the smarter property choice. Showcasing over a million UK properties for sale or to rent, there is definitely a lot to love about this app. It creates instant alerts for your favourite searches and also sends you matching properties as soon as they are added. No need to worry about losing recent searches, the app enables you to sync your browsing activity easily across all of your devices, allowing you access whenever and on whatever device you wish. The app also displays beautiful photography, floorplans and more, to help you really get a feel for each property. If you want to know more about a specific location, then this is the app to do just that. Simply type in the location and it will display pretty much all you need to know- from school and hospitals, to local shops, restaurants and even petrol stations. Known as the ‘Tinder for Houses’, Knocker is a fun and addictive way to search for properties. Based on your current location or favourite place, it allows you to swipe until you find something that takes your fancy. It is perfect for those times when you’re in a bar or café, away on business or holiday, or just feeling a bit nosey and simply want to know how much it would cost to live in a specific area. Save properties as you go along, and when you find something special, share it with your loved ones. The perfect home inspiration and design app, that will help create your dream home. With over 15 million interior images to browse, as well as lots of design and advice articles to read, Houzz inspires you to put together plans of how you’d like to decorate your new home. It also allows you to locate interior designers local to you, great for when you need those little tips and a helping hand. 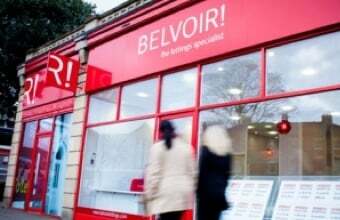 All these apps are available to download via Andorid or iOS, so why not have a browse and give them ago, and remember to keep an eye out for those Belvoir properties!